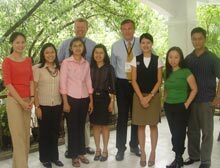 Joining liberal leaders from Asia, Europe and Africa, newly elected Chairman of the Board of Directors of the Friedrich Naumann Foundation (FNF) Dr. Wolfgang Gerhardt visited the Philippines from June 21 to 24, 2006. 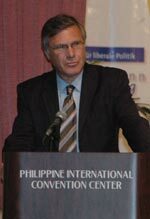 Dr. Gerhardt came to Manila for an international conference entitled “Migration, Population and the Globalization of Labor” organized by the Council of Asian Liberals and Democrats (CALD), the Alliance of Liberals and Democrats for Europe (ALDE), Liberal International (LI), the Liberal Party of the Philippines (LP) and co-sponsored by the Friedrich Naumann Foundation. During his stay in the Philippines, the FNF chairman had personal meetings with liberal leaders from Europe and the Asian region, among them LP and Philippine Senate President Franklin Drilon, the leader of the Cambodian opposition party Sam Rainsy and Mr. Martin Lee from Hong Kong. Dr. Gerhardt also met with the leaders of the Foundation’s regional partners, the Young Liberals and Democrats of Asia (YLDA) and the Regional Working Group for an ASEAN Human Rights Mechanism (RWG). To discuss recent developments in Philippine organized liberalism and the state of human rights in the country, the FNF chairman held a meeting with Solicitor General Eduardo Nachura.